Nonesuch Records compiles a selection of duets recorded live during Joshua Redman and Brad Mehldau's European tour. 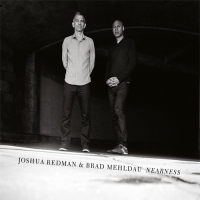 The album, Nearness, is the first duo album from friends and collaborators saxophonist Joshua Redman and pianist Brad Mehldau. The album is released on 140 gram Double LP pressed at Record Industry in a single pocket jacket with insert and limited time download card. "It's like one of those friendships where you don't see someone for a long stretch and then you fall right back where you left off", Mehldau told the Ottawa Citizen when he and Redman performed at the city's jazz festival in 2011. According to the Citizen's Peter Hum, these two friends are "among the most potent and influential jazz instrumentalists of their generation, and what Mehldau calls 'picking up' is in fact world-class improvising before rapt audiences".